My name is Ronald Thomas. I became a member of WE ACT many years ago when I was going to school at the Pratt Institute at the Pratt Center for Community and Environmental Development in 1993. As an avid cyclist and a member of WE ACT, I know that climate change is a real threat. This is why I showed up for a trip to the New York State Capital in Albany before dawn on a morning in February — it was cold and dark but I did not care. We all boarded a sleek charter bus at 6:30 am. 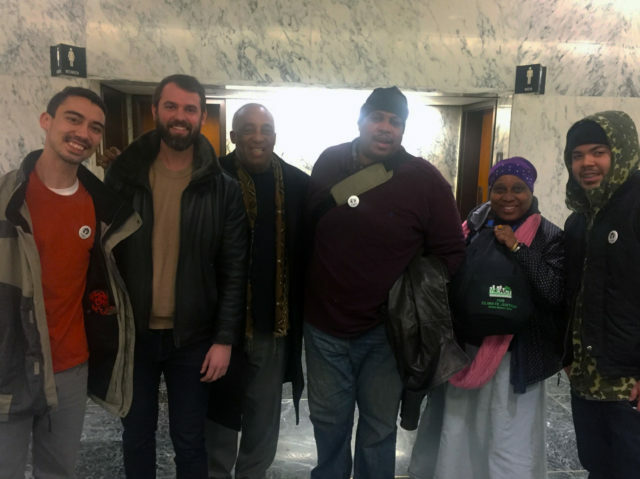 I was alert and bright-eyed, wondering how we would be received at a hearing before the powerful New York State Legislature and corporate lobbyists seeking to have influence over the legislative business of the state. This trip was put together by the grassroots environmental organization called NYRenews. We waited till about 7am before we shoved off for Albany… and I thought I might take a nap. Instead, the energy of my bus companions had us all chattering for two hours and before I knew it I was in Albany. The state campus is humongous with spectacular towering architecture nestled upon a sweeping acropolis, implying the power of kings, emperors, and empires. I thought to myself, could this be what they mean when the talk about “the Empire State”? We walked through security and entered the underground concourse which was a vast mall of shops, restaurants, offices, and the elevators which allow you to visit “the Gods of Legislation” who are actually our public servants. The place can make you feel small, like you do not really matter in all of these palatial surroundings. But, in reality, it is the other way around. We can vote in regular elections and become a familiar face to those who make our laws. They are there to serve us or we vote them out. It is all about government by and for the people! In fact, we want a piece of legislation called the New York Climate and Community Protection Act (CCPA) (S.8005 / A.10342), the most ambitious and far-reaching climate bill in the country. No other legislation cuts greenhouse gas pollution from all sectors of the economy, protects communities and workers on the front lines of climate change, ensures new jobs in the clean energy economy conform with fair labor standards, and requires all state government decisions to align with climate and equity policies. You can learn more by watching the video below, or visit nyrenews.org. During the hearing, we got up in the chamber and chanted our demands very poetically and very loudly in our orange t-shirts. We chanted, “TRUMP IS A CLIMATE EMERGENCY, CUOMO SHOW SOME URGENCY” and waved our orange signs. We were so loud that when they see us again they will say, “Here come those environmental loudmouths again!” We had such a good time shouting and performing, we worked into a near frenzy and they asked us to leave the chamber. We left to go talk to some of the assembly office staff to inform them of some of our position and what we think needs to be done within the district. This is called “lobbying” your legislator and it is very important to make your voice heard. By 3:30 we were on our way home feeling quite good about our day’s work, knowing we had just put in our first installment of many days to come. This experience helped me widen what I believe it means to be a citizen. This is what citizens do in addition to reading, writing, studying, wondering, questioning, socializing, investigating and enjoying the political process. To learn more about becoming a member and getting involved, visit WE ACT’s membership page. 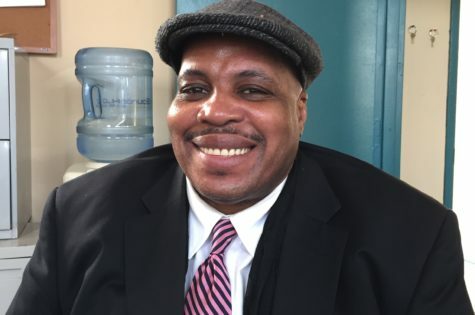 Ronald Thomas has lived in Hamilton Heights all of his life and plans to stay and finish this college education and remain in the community.